How do you invite people to come to worship at your church? First, says Bauman, her flock at Bethany Lutheran (ELCA) on 36th Avenue in the Longfellow neighborhood of Minneapolis merely invites people into the building. Aren’t we all. Sometimes it flops, to be sure. Bauman planned and promoted an Advent event in 2012 for kids in the neighborhood. Nobody came. Nobody. Even so, at Bethany on 36th Avenue the welcoming strategy seems to be paying off. These days the church is booked most weekends with events other than worship. The neighborhood has noticed: For a while, it was pretty quiet at this Bethany. Now neighbors notice vehicles in the parking lot. The church is coming to life. The neighborhood environmental group meets each month. There is a movie night, a pancake night. The church asks sponsoring groups for donations to help cover extra utilities costs. Bethany Lutheran is burdened with some recent history. 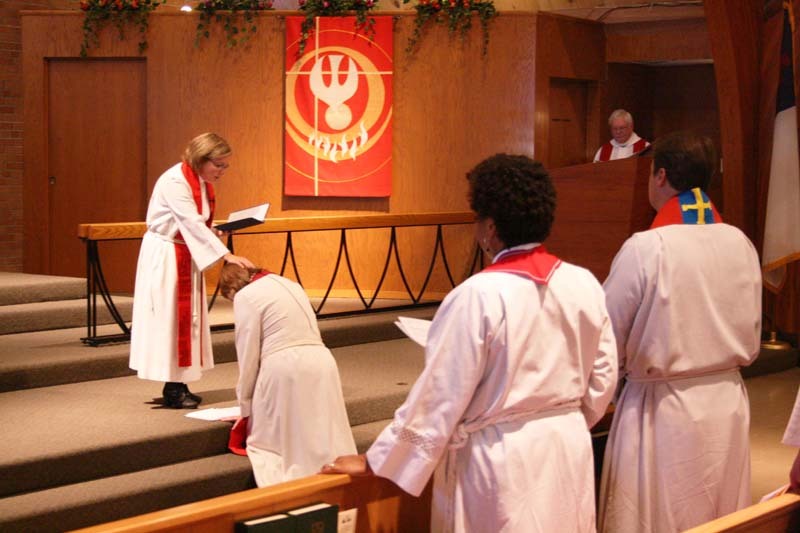 It lost a pastor and many members over the ELCA’s 2009 decision to allow gay clergy in committed lifelong relationships. Bethany on 36th Avenue was a deeply divided congregation: It voted to stay with ELCA, just a few votes short of the two-thirds required to leave. The pastor resigned and many members left. The newly-installed Rev. 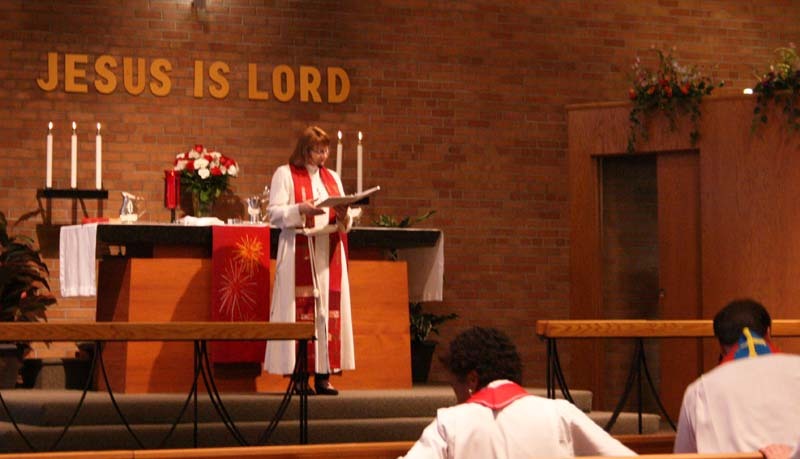 Jo Bauman presides over the Eucharist at her new congregation, Bethany Lutheran Church (ELCA) in Minneapolis. Now Bethany’s called pastor, Jo Bauman started as an intern with financial support from Lord of Life Lutheran Church in Maple Grove. About 50 faithful now worship each week at Bethany, many of them older. Remaining members are trying to renew the congregation. The circumstances are complicated, if not unique. Four other ELCA congregations are within a couple miles — including another Bethany Lutheran on Franklin Avenue. Making things more tangled still, the Franklin Avenue Bethany is a “reconciling in Christ” congregation; it openly welcomes gays and lesbians. Bethany on 36th Avenue is not formally a “reconciling in Christ” congregation. It merely welcomes all, explains Bauman. Could there be a rostered leader ready for a challenge given the circumstances at Bethany on 36th? The seminary’s response was quick: “impossible,” according to Skulstad. The next day, however, Skulstad received an email. His contact at Luther Seminary had found just the person: Jo Bauman. Now Bethany’s called pastor, she started as an intern with financial support from Lord of Life Lutheran Church in Maple Grove, a thriving suburban congregation with 8,500 members. Part of the reason for the support is that Senior Pastor Peter Geisendorfer-Lindgren of Lord of Life is a son of Bethany on 36th. The 45-minute drive separating the two congregations precludes frequent in-person cooperation, but Lord of Life sent a bus recently to bring Bethany members to an Older Wiser Lutherans (OWL) event, and Lord of Life youth do some service work in the Bethany neighborhood. Jo Bauman comes at pastoring by an odd path: She spent 18 years as an architect, then 13 years of sales and marketing to design professionals. And now she is a minister of the gospel. When she found herself at Luther Seminary in St. Paul, she was still mystified. “I could not figure out why God wanted me to do this,” she said. So is Bethany Lutheran on 36th Avenue in Minneapolis a miracle in the making? We will have to wait and see — but don’t be surprised at occasional setbacks.